'The 'Squatters'...' was published by Solidarity (South London) in September 1969. No authors name is given in the pamphlet. An advert for it in Solidarity (West London) No. 2 attributes it to Andy Anderson. Just let it burn down baby." After a few meetings, it was decided to launch a campaign. The aim of the campaign was to start a movement among the millions of badly-housed people by suggesting action that they themselves could take. The discussion centred on the fact that there were a large number of good, habitable houses and flats all over London which had been standing empty for a long time. One kind of action that people themselves might take was squatting. The group decided to call itself The London Squatters' Campaign. Squatting, in one form or another, is not new. It is in the historical tradition of mass radical action by ordinary people stretching back over the centuries (e.g. The Peasants' Revolt of 1381, The Levellers and Diggers of 1647/49). By this time, militant members of the Communist Party had broken out of the ’official line' which had condemned the movement when it started, and were active among squatters in London who had taken over large blocks of flats and hotels. So the Government was eventually forced to make concessions in order to keep some control of the situation. Local authorities were given wide powers to requisition empty properties for use by homeless families, and the Ministry of Works offered Aneurin Bevan 850 former service camps - ’to help him in his emergency housing drive’. The answer to the question of whether people were ready for such action depended on the campaign showing clearly that it could be taken by the badly-housed people themselves, that they could organize themselves, that they must not rely on an outside organisation nor on ’leaders’ to act on their behalf. Last year, on Sunday December 1, we occupied a block of luxury flats in Wanstead (East London). Most of the flats had been empty for years, which is not surprising as far as the nine million slum-dwellers are concerned - they cost nearly £16,000 each. A banner announcing the London Squatters Campaign was mounted on the roof. Although the occupation lasted only a few hours, it all made good copy for the press and television. On the Monday, nearly every national newspaper carried front-page pictures and reports. On Monday evening, four members of the Campaign appeared on the Eamonn Andrews programme. In answer to a question from the oily Andrews, one of them made the basic aims of the campaign quite clear. He said, "We don’t represent anybody. Unless badly-housed people soon take up the idea of squatting themselves, we shall consider that the campaign has failed." A couple of Campaign representatives trailed by T.V. cameras and about a dozen reporters went to see the vicar. The Reverend, who was accompanied by his boss, the "Venerable "V.D, Wakeling, had little to say when asked to let the house to those in real need. The Ven. Wakeling took up the question. He said that the house was empty because it was going to be pulled down to make way for a church hall in the early 1970s and that people’s spiritual and religious needs were greater than their housing needs. To make matters worse, various T.V. programme teams were touting around to get material for programmes they wanted to do either on housing in general or on squatting in particular, They wanted to film meetings and interviews. They wanted to film the practical work - collecting furniture, food, etc. and preparing barricades. Some of the original campaign members had begun to 'drop out. They were dropping out because they could find no way of bringing the campaign back to its original aims. Attempts to do so were met with incomprehension on the part of some of the ’new’ mish-mash. Liberals and Shelterites were concerned with keeping the image ’respectable’. International Socialists talked, of course, about ’politicizing the movement’. Some of those who remained of the original group said they fully agreed with the original aims, but they went on to act in accordance with different priorities. Some of them actually said things like ’it is time for the poor and dispossessed to think and act for themselves’ and almost in the same breath they would talk of the Squatters installing families. Certain individuals have allowed themselves to be regularly referred to in the press as 'leaders’. Maybe the press used the term simply because they behaved in the traditional manner of leaders. In any case, these ’leaders’ have made no serious attempt to get the term changed. We see this as reinforcing people’s illusions in the need for a leadership outside of themselves. This, as we said earlier, is precisely what the original group had been determined to avoid. But it has gone even further than that. Some of the published statements of these 'leaders’ have also added to the illusions. They have said that dozens of homeless families are waiting to he housed by them. A widely circulated list of instructions entitled "Do's and Dont’s for Squatters" began: "Don't move families in without careful planning." This attitude was responsible for the state of affairs in which squatting families in Ilford fully expected these 'leaders' to carry out some of the most simple jobs around the house, such as repairing broken windows. But with their professed beliefs, these ’leaders’ should not have been surprised by such a development even if they were unaware of the perfect example seen in the squatters’ camps at 1946. Then, there was a sharp contrast between the attitudes of those who had taken over the camps on their own initiative and those who had eventually been placed there by local authorities at the behest of the Government. A report in the NEWS CHRONICLE of January 14, 1947, described how workmen put up partitions and installed sinks and numerous other conveniences in the huts of official squatters, whereas the unofficial squatters had to fend for themselves. But the latter "set to work with a will, improvising partitions, running up curtains, distempering and painting... The official squatters, on the other hand, sat around glumly ... bemoaning their fate, even though they might have been removed from the most appalling slum property..."
The Ilford 'leaders’ have also publicly described events as 'enormously significant', 'tremendous breakthroughs’, and 'tremendous victories'. The description of one such ’victory' suggested that all the members of Redbridge Borough Council had undergone the most modern operation in heart surgery - a transplant. This particular ’victory’ occurred on March 19 when the Redbridge Council told the press that they were writing to all the London Boroughs to offer them empty houses in Ilford for use as temporary accommodation for the homeless families of their areas. This said the squatting leaders' press statement, was a victory because it showed that the Councillors had had 'a complete change of heart' . Even if the Redbridge Council had had 'a complete change of heart' and intended to do what they had said, it would merely have been a move to enable them to regain complete control of the situation in Ilford. The nine million people still living in squalid slum conditions had not noticed any change of heart going on anywhere, complete or otherwise. It is significant that the campaign's original emphasis on the fact of these millions of slum dwellers had, by this time, almost disappeared. Most of the talk now was about action on behalf of homeless families in local authority accommodation. During March and April, the Council's mercenaries made violent raids on three houses and evicted the occupants including homeless families. 4 On two occasions during June, they made further attacks on houses at 23 Audrey Road and 6 Woodlands Road. Although wearing steel helmets, carrying shields and throwing bricks, the mercenaries were beaten back and forced to give up each time. The gangster activities of Quartermain are not new. They include strikebreaking and go back some years. But they were certainly brought into the limelight again by the events in Ilford. Those who fought them are quite right in regarding this as an important achievement. It was an exposure of something very sinister and it was a defeat of vile and vicious methods of eviction. But it had been gained at considerable expense - to the family in 23 Audrey Road. Leading Squatters then had discussions with leading members of Redbridge Borough Council. An agreement was reached about calling off the campaign in Ilford. This agreement was ratified by a simple majority vote at a meeting held in the 'Squatters' office' (a shop in Ilford) on 25 July. It is not known how this meeting was called or who was invited to attend. However, the agreement was signed the following day, Saturday 26 July, by Ron Bailey. It is said that Mrs. Fleming and one other also signed it. So far as we have been able to discover, no copies of the text of the agreement have been produced. 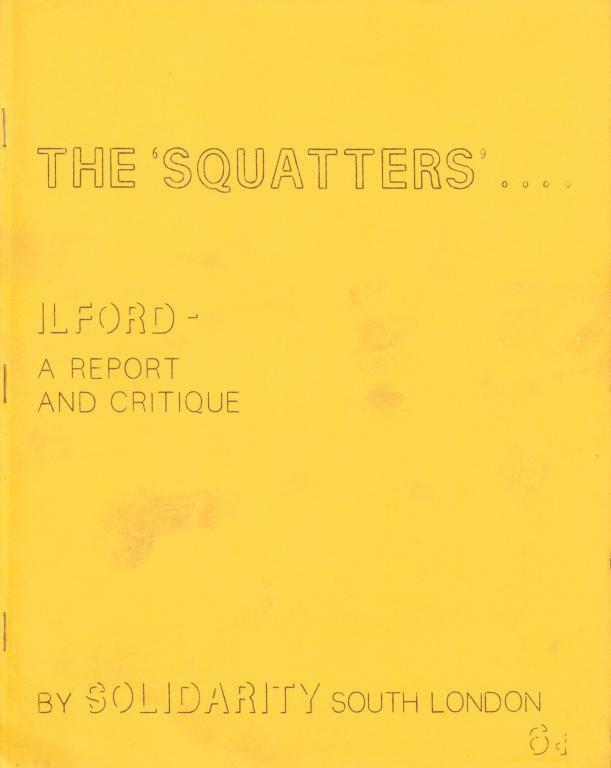 But press reports stated that the 'Squatters' had terminated their activities in Ilford. They had agreed to leave three houses by noon on Thursday 31 July, and to refrain from occupying any other houses. The Council, for its part, had agreed to provide accommodation for the families involved; to examine its empty property in Central Ilford with a view to providing short-term housing for local families only; to carry out this examination by 16 August and to inform the ’Squatters’ of their findings. There was some trouble with the people occupying 6 Woodlands Road. They refused to get out. So the supporters of the deal now calling themselves the East London Squatters, issued a statement 'publicly' dissociating themselves from the Woodlands Road group, and accusing them of being 'would-be martyrs' who had set up a permanent communal doss house. This, said the East London Squatters, was contrary to the aims of their campaign which were to 'fight for the basic human rights of those who are denied a decent place to live.’ They appealed to political groups, and to all those who agreed with their aims to put some sort of pressure on the occupants of the Woodlands Road 'doss house' to persuade them to leave. Those who complied either sent letters in or visited the house and harangued the 'would-be martyrs'. One should no longer be surprised therefore when the 'Squatters' hail the agreement with Redbridge Council as a "crucial victory". It is of course no kind of victory in terms of the original aims of the London Squatters Campaign. It might be some kind of victory for the newly-named East London Squatters' aims of fighting for other people's rights - provided, of course, that Redbridge Council do use their empty houses as short-term accommodation for homeless families. We have strong criticisms of Shelter, the charity organization which raises funds for housing homeless families. But at least it does not pretend to be anything but reformist. Whether or not one agrees with Des Wilson (director of Shelter) that the Squatters' main achievement has been in keeping the question of homeless families before the public, it is difficult to disagree that 'victories' - in concrete terms of how many homeless families have been reasonably well housed - can more legitimately be claimed by Shelter than by the 'Squatters' . One 'Squatters' leader, presumably anticipating criticism, recently wrote that what they are now doing "may be too tame for revolutionaries". Our criticism flows from the aims of the Squatters' campaign when it was first set up. Read them again on pages 1 and 2 of this paper. We felt that an attempt to achieve these aims was a worthwhile activity for revolutionaries. Do-gooding was not involved. Nor was there any question of becoming adjuncts to local authorities and welfare agencies who were 'failing in their responsibilities to the community'. It was understood that if a fairly large-scale squatting movement developed among the millions of slum-dwellers, the authorities (national and local) would have tried everything to stop it. As it turned out, the 'Squatters' themselves stopped us discovering whether people were ready to move. They stopped it soon after the first occupation in Ilford. Maybe a substantial number of those in dire need of decent housing were not prepared to take up squatting by themselves as they were in 1946. But we really do not know. The nine million badly-housed people and the 20,000 officially homeless are all working-class. The question of the conflict of interests involved in the housing problem is part of the whole struggle, The answer to this, to the conflict in industry, to the conflict in what is called education, to the host of others that make up the total conflict in our everyday lives, will be found ultimately and only through the direct action of people themselves, outside parliament, outside local authorities, outside political parties, outside unions, and outside any other organization which claims to be acting on behalf of working people in their struggle to be rid of exploiting class society. Under the agreement between the 'Squatters' and Redbridge Council (see p„7), the Council leaders promised that by 16 August they would (a) carry out an examination of their empty property in Central Ilford with a view to providing short-term housing for local families, and (b) inform the 'Squatters' of their decisions. Some of the 'Squatters' who were in favour of signing the agreement now believe that the Council welshed on it. Even the few who are still prepared to defend it will not go so far as to say that the Council kept their side of the 'bargain.' Although the Councillors carried out their examination by 16 August, they did not inform the 'Squatters' of their decision as promised and the 'Squatters' have not pursued the matter. They seem to have complied with the Council's slogan "Squatters Go Home!" We have seen subsequent press reports and Council minutes. Apart from a motion heartily congratulating the Town Clerk, Mr. Kenneth Nichols, on the way he handled the whole squatting business (Nichols called in Quatermain), information about accommodating badly-housed and homeless families in houses acquired for demolition in the 1970s is hazy. They have said that most of the empty houses will not be used as temporary accommodation because in some cases the ground is needed for car parks and in others the cost in making houses habitable would be too high. This implies that at least a few houses will be made available. We have made enquiries at several places, including the Town Hall, but nobody knows which houses are to be used and no families, local or otherwise, have been offered temporary accommodation in them. What a 'crucial victory''. Following World War II, London's economic, social and political lead increased greatly in comparison with the rest of the country. Economic policy, making exports the high priority, has helped in increasing London's dominance. Together with these changes, the country's economic system has undergone a transformation which is expressed by the great increase in bureaucratic administration. Property developers have not been slow to see the opportunities for amassing large fortunes. Hence, the 'office boom' of recent years which has spread well outside the Greater London area. During the last few years, in Greater London alone, some 20 million square feet of office space have been added - enough for more than 200,000 workers. Development plans for London and surrounding areas will add many more millions of square feet in the next few years. (For example, the development plans for Ilford by Redbridge Borough Council include several large office blocks by 1974). There will then be enough space for several hundreds of thousands more office workers. The increasing number of office workers creates other new jobs in related or service industries, e.g. transport, catering, shops. Obviously, the demand for housing increases. It's a fact that house-building has been hopelessly inadequate whatever the party-political shade of the government. Successive governments have, at the same time, encouraged the building of houses for sale rather than for rent. This has been at least as much a political decision as an economic one. They know that when working people are compelled to put the weighty millstone of a mortgage around their necks in order to satisfy a need as basic as decent housing, such people will be much easier to control. The mortgage is yet another of the weapons used by our rulers to undermine people's will to struggle against them. And of course, rents, house prices and interest rates have continued to rise sharply. For example, houses in slum areas such as Islington and North Kensington now sell for between £4,000 and £6,000 where they cost £2,000 to £3,000 ten years ago, and £350 to £600 in 1947. All this operates progressively to the disadvantage of lower-paid manual workers. 1. "Official" figures are:- 1950: 6,254, 1965: 12,411, 1968 (Dec.): 18,689. 2. Some reasons why housing is so bad are given in the appendix. 3. For an account of Quartermain's background, see - SOLIDARITY (South London) Issue No. 4.